The SNP triumphed in 2015 by outflanking Labour to the left. The Labour Party under Jeremy Corbyn is now coming back by outflanking the SNP to the left. This was not hard as the SNP tends to talk left but not act it. Kezia Dugdale has resigned because she is unhappy with tacking to the left; indeed as a third rate machine politician she has never given any indication of philosophical conviction at all. A large number of those voters returning to support Scottish Labour from the SNP have not abandoned their support for Independence, and having a significant Indy supporting section of its voter base is something which ultimately Labour will have to come to terms with. The shift of the left to support the SNP had left Scottish Labour as this strange rump of beached Blairites and Brownites, to the extent that even the (tiny number of) ordinary members were not supporters of Corbyn. That too will change. I have no doubt that Corbyn’s opposition to Independence was tactical and caused by the need to placate this Scottish Labour establishment. I can foresee Labour moving to become much more Independence friendly over the next few years – its Orangemen have already largely shifted to the Tories. A number of people have suggested to me that I am myself moving towards joining Labour. The answer to which is, not until the last member of the GMB is led by the ears down Sauchiehall St with a Trident missile shoved up their arse. That is not as facetious as it sounds. For me the GMB characterises everything that is wrong with the entire founding principles of the Labour Party. If somebody announced a new WMD had been developed which only kills babies less than 10 months old, the GMB would say that was great, providing their members could build it. Before anybody argues, remember their members already build WMD which would inevitably incinerate millions of babies. There is much concentration on Labour’s appalling Blairite MPs, and I could certainly never vote for a large majority of their people at Westminster. Until Corbyn manages a real purge there is no way I would even think of voting Labour. But people forget it has historically been the trades unions who have defeated all previous attempts to use the Labour Party to advance a left wing agenda, and who even now enforce support of Trident and of nuclear power. Middle class intellectuals tend to have a misty-eyed view of dignified, auto-didactic workers. I have seen too much of the world (and of the racist, xenophobic and significantly working class English Brexit voters) to harbour such fantasy, and too much contempt for political correctness to pretend that I do. It is extraordinary how many people feel the unions should be above criticism because they represent the working class. Increased union workplace power is now essential to help rebalance the economy; but they should not be fetishized. That is more space about Labour than it currently deserves. Meantime it is foolish to deny there is something of a crisis of confidence in the Independence movement. Every three months or so, for almost the past three years, I have published that I am yet to hear one single post-referendum statement or speech by a senior SNP figure explaining the advantages of Independence. Well, I still haven’t. Having conclusively proven in a dismal Westminster campaign that not mentioning the benefits of Independence is a seat loser, the SNP is resolutely continuing not to mention the benefits of Independence. There has however been a change. Before the Westminster election, the SNP would not talk about Independence but would talk about the tactics of achieving Independence, principally referendum timing. Now they have a new tactic of never mentioning Independence at all. Instead they concentrate exclusively on good governance within the Union. Personally I have no interest at all in pretending that the glorified regional council at the bottom of Holyrood Road is a national parliament, when it is not even consulted on whether the nation goes to war, cannot stop forced deportations of valued residents from local communities, and cannot prevent extradition of citizens to face English courts (I am myself up in the English High Court on a libel charge soon). We do not really have a Scottish parliament or a Scottish government. We have a glorified council. But there are many in the SNP who appear pretty well satisfied with the status quo, given a few extra powers handed down when we leave the EU. Brexit is being forced upon Scotland demonstrably against the will of the nation. It is an economically suicidal policy and yet the SNP appears meekly to be now discussing its implementation, rather than reaching for the national sovereignty that would prevent it. That we are forced out of the EU against our will is the ultimate proof that the near useless institution in Holyrood is not a Parliament. There are too many people within the SNP who are content with Scotland’s pretend national status and very real humiliating colonial status. There are too many people in the SNP who earn a fat living from being politicians within the UK system they are only pretending to oppose. The SNP is starting to look like the classical elite “native” ruling class the British ruled through in nearly all their colonies. The SNP, far too many of them, have cushy well-paid jobs within the devolution settlement and are not personally inclined to take risks. The SNP begins to look like a controlled opposition. The unionist establishment is delighted with the SNP. The SNP soaked up all the energy of the Yes movement, and diverted it into a cul de sac away from any agitation for Independence. Energies have been dissipated on elections within – and not challenging – the UK governance system and on a series of pointless consultation exercises. Opposition to Brexit has been corralled and dissipated. The SNP has effectively done the British Establishment’s job for it. I so not exclude Nicola Sturgeon from this criticism. Indeed it is chiefly a criticism of Nicola Sturgeon. In the course of the last referendum campaign the YES camp gained an astonishing 17%. The reason was that the actual arguments for Independence were heard. That has not happened since – those in a position to have the argument heard, have chosen in their own interest not to make it. Yet still I have no doubt that, if we only get the chance, the next campaign will see us sprint home in triumph. What the SNP are in danger of becoming is the gatekeepers who deny us that chance. The SNP needs to recover its nerve, and needs to demonstrate it exists to achieve Independence, not to make personal careers. Another referendum needs to be called by this Holyrood parliament; it would be a brave man or woman who predicts the De Hondt system will deliver a pro-Independence majority in the next one. I urge everybody to stay with the SNP, as I see no practical alternative way forward. But we need to make plain to the leadership that we are starting to become not just disappointed by them, but angry with them. Yet I live here in a city which still has a Cumberland Street, named after a disgusting war criminal who perpetrated long term and systematic atrocities on this very people whose capital city is desecrated by his name. Cumberland was a worse racist and an infinitely greater war criminal than Robert E Lee. Yet I hear not a whisper to echo the brave roar of Charlottesville. The imposed regime which crushed Scotland, outlawed its major language and much of its culture and tried to expunge even the memory of its history and native culture, is celebrated in the heart of the nation. Hanover Street, George Street, Rose Street, Princes Street. These vicious, arrogant, Scot-hating people really did crush Scotland’s spirit, to the extent we still cringe before them now they are long dead. It staggers me that, after we have decades of an element of home rule by alleged Scottish Nationalists and an alleged Labour Party, when even the pathetic colonial status of the devolution settlement gives the power to rename a few streets, Labour and the SNP, as the minimum gesture of self-awareness and a tiny, tiny glimmer of self-respect, have not renamed Cumberland Street after Keir Hardie. Yes, we have always suffered from a parcel of rogues in a nation. Yet we remain a parcel of cowards as a nation. The brave left wing demonstrators of Charlottesville, supporting the removal of Robert E Lee against the violence of the fascists, put us to deep shame. Five Days to Go to the Best Party in Scotland! There are five days to go to the best party in Scotland. Not the Edinburgh Festival, with its Fringe of 2,000 talentless sweary comedians playing to stag and hen parties who cover the street in vomit, and its stalls selling £5.50 small slices of pizza. 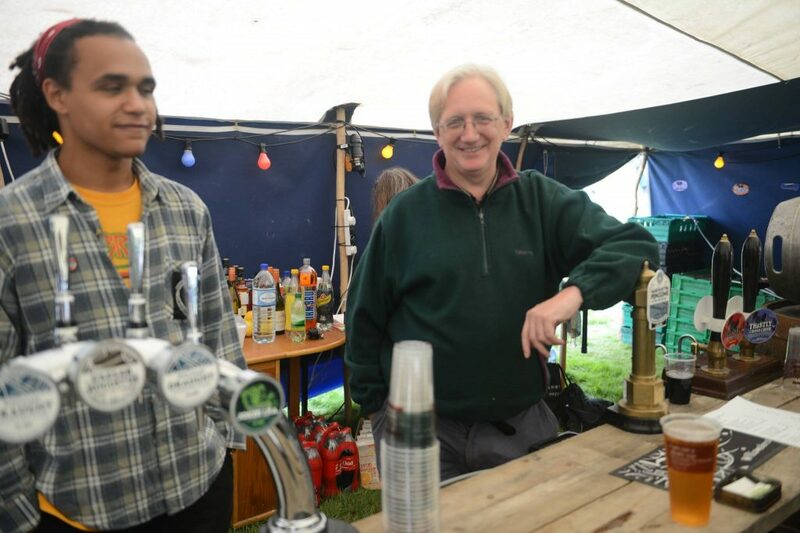 No, there is a world of nice people, talented musicians, and great beers and ciders, passingly quaffable wines, fine whisky and fashionable artisan gins and tonics all served by me. It’s called Doune the Rabbit Hole and it starts on Friday. Both weekend camping and day tickets are still available, and I now have a discount link I can give readers of this blog. I am going to be foolishly honest here. After 7 years in which the festival has grown by 15 to 30% each year, this is the first year when we have a serious decline in sales. This genuinely puzzles us, and I think it is partly because last year the terrible weather (freakishly cold and wet even by Scottish summer standards) gave many people a bad experience. Thankfully this year’s forecast looks great. And as we are the only music festival I am aware of in Scotland which is not currently in receipt of any public funding at all (though I keep trying) we really do need to sell some more tickets. There, that was refreshingly honest, wasn’t it? You don’t have to take my word it is great fun, there is plenty of evidence. It is particularly designed to be family friendly without being in the least uptight. Do join us. I believe if the money is an issue, we may still have room for more volunteers. At this stage get in touch with me direct via the contact button top right of the blog. Imagine that today’s Scottish Independence movement fades away to nothing – and then J K Rowling and Euan McColm get to write the history that defines what the Independence movement was, and what the Independence movement stood for. Then imagine the effect of 250 years of teaching the Rowling/McColm version in schools, universities and media narrative, until everybody absolutely “knew” that the 21st Century Scottish Nationalists were homophobic, racist, sexist, vicious xenophobes. Well that is precisely analagous to what happened to the Scottish Jacobites. Almost everything you believe you know about the Jacobites is a deliberate lie. The effect has been to make us think of the Jacobites as on the wrong side of history, doomed, anachronistic and faintly ridiculous. This has succeeded in making Scottish nationalism ashamed of its historic roots, by comparison for example with the Irish, who revere their resistance fighters. It has thus helped blind Scotland to its colonial status, in a way the Irish were never blinded. The whole effect has contributed massively to the national inferiority complex. Ireland has a much smaller population than Scotland and a fraction of the national resources. Yet yesterday it released economic statistics that showed its economy growing at 4.5%, when income per capita already exceeds Scotland’s by 25%. The national inferiority complex that leads so many Scots to believe that Ireland can be a very successful independent country but Scotland never could, is in many ways rooted to the lies that state propaganda told us about ourselves and our history. And the Jacobites are a key part of that. What is more, everything you are about to read here is not under serious academic dispute. This is now the accepted truth as unearthed by modern scholarship. This has been the case for a couple of decades now in History departments of our best universities – but has had zero effect on popular opinion, formed by centuries of propaganda. Let me recommend to you Prof. Murray Pittock’s brilliant Culloden, published last year, and Maggie Craig’s Bare-Assed Banditti, which is written with less historian’s jargon. The book you really need is my next book, a biography of George Murray, but I still have two years’ more research to do before I can write it. Here is a short list of myth-busting facts about the Scottish Jacobites. 2) Scottish Jacobites overwhelmingly did not, in any sense, support increased monarchical power or a rollback of constitutional government. 3) Scottish Jacobites wanted above all an Independent Scotland. The first major act of the Jacobites on taking Edinburgh was to repeal the Act of Union. Prince Charles Stuart, acting as Regent for James VIII, on 9 October 1745 did formally repeal the Act of Union. That’s something they didn’t tell you in school. 4) That is why they fought under the Saltire. This was overwhelmingly their banner at Culloden. It did not mean anything different then than it does now. When they carried their saltires at Culloden, they meant precisely the same thing that we mean when we carry them through George Square today. 5) One of the most pernicious lies is that there were more Scots on the British than the Scottish side at Culloden. This is completely untrue – by a margin of four to one. The maximum fencible potential of Scotland at this time – the number of fighting men who could conceivably be put into the field given the population and other unavoidable economic activities – was 30,000. At its greatest extent the Jacobite army contained 12,000 Scots, and there was much turnover. A clear majority of the potential armed men Scotland could put into the field, at some stage turned out for the Jacobites. 6) The large majority of the Scottish Jacobites were not Highlanders. The idea that it was the intellectually and emotionally stifling extreme Calvinism, the legacy of John Knox and the Covenanters and the begetter of the Orange Order and the Democratic Unionist Party, the most narrow-minded doctrine in all Western European history, which was the force for “modernity” and progress, is self-evidently risible. Yet we have all been taught to believe it and it is implicitly accepted in our received historical narrative. Similarly we are taught that the defeat of the Jacobites was essential to bring in the Scottish Enlightenment, despite the fact that at least half of the key figures in the Enlightenment were demonstrably Jacobite in their sympathies. Of course the Jacobites were not a “national” movement in that there was a sizeable minority of Scots who opposed them – just as there was in 2014 (in 2014 a minority of Scots as opposed to Scottish residents, a different question). And the pro-British minority of 1745 was founded in sectarian bigotry, the directly traceable ancestors of the fascist thugs who stormed George Square after the referendum. Those willing to come out on the British side naturally increased in 1746 after it became plain which side was going eventually to win. Just as Parisians turned out en masse to cheer Petain when he visited during Vichy. That does not make the Vichy French the main stream of French history. By the time we get nine generations back to Culloden, we have 1024 direct ancestors. I can be reasonably certain from family history that some of of mine lie in mass graves with the Athollmen at Culloden. My parents used to live in Incheswood, close by the battlefield, in the days before it was fenced. I have probably visited the site over the years much more than most people. I have never done so without crying for those who died fighting for the cause which is the same cause I work for. We have very few monarchists in the Independence movement, and I am most certainly not one. But that is only one of the many psychological obstacles erected to alienate us from those who died in the very last battle of the Wars of Independence. I have no shame in embracing this part of our history. Until we get comfortable with our history, our future will remain out of reach. Is it the BBC, or is it Me? Until now I have stayed out of the silly season sniping between nationalists that has set in these last few weeks. I rather hoped it would abate after Robin McAlpine’s excellent oil on troubled waters effort, but it has re-erupted with a virtue signalling, holier than thou mess by Ross Greer in today’s Sunday Herald. I am afraid, Ross, that I am one of those irredeemably straight, white, old and male people. So you can discount what I say already. a) I think Cat Boyd was wrong to vote Labour rather than SNP. I would urge everyone in Scotland to support the SNP as the only practical route to Independence. However I do share the frustration of many with the SNP’s timidity on social reform and its continued, and frankly infuriating, failure actively to campaign about the benefits of Independence. Quite a lot of Independence supporters voted Labour, including some of my own family. b) I think Stuart Campbell is wrong to sue Kezia Dugdale for defamation. I believe in free speech and if someone brands you with an unfair insult, the answer is to argue why they are wrong, not head for the courts. However, having said I think they are both wrong, I should state that my very considerable regard for both Cat Boyd and Stuart Campbell is entirely undiminished. Why on earth should I expect people to act in the way I think they should act? And why should I assume that my judgement on these calls is superior to theirs, as opposed to just different? If everyone acted as I want them to, the world would be weird. Indeed, if I am so clever why am I typing up this at 3am? And why on Earth would the Yes movement want everyone to behave the same way all the time? So in short, neither Cat not Stuart acted as I would have, but I accept they are acting as they believe best. In fact the criticism of both of them has been much more of a problem than their particular actions. You don’t have to be perfect to work for Scottish Independence. But it would be a great help if we saved our bile for the unionists. Doune the Rabbit Hole 2017 is fast approaching, this year from 18 to 20 August. As regular readers know, this Festival is very important to me personally in recharging my spiritual batteries. A weekend in idyllic Stirlingshire surroundings amongst kind and caring people in a kind of “pop up community”, it is a brilliant way to de-stress. The musical selection is stubbornly non-commercial and often I find myself enjoying completely unexpected things. I must say though having Steve Davis (yes, that Steve Davis) doing a DJ set this year is rather intriguing. The music is important, but it is primarily a lifestyle festival. It has no political agenda, but it is fair to say that readers of this blog will be in company in which they feel comfortable. And of course, as always I shall be running the bars. Running a bar is perhaps what being a former Ambassador best qualifies you to do! If you have more energy than money, there are still positions open for volunteers. Contact [email protected] and quote that you came through this blog. Have just found a YouTube about Steve Davis as DJ.